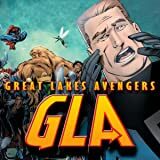 Collects GLA #1-4, GLX-Mas Special, Thing (2006) #8, Cable & Deadpool #30, Deadpool/GLI Summer Fun Spectacular and material from Marvel Super-Heroes (1990) #8, I Heart Marvel: Masked Intentions, Age of Heroes #3 and I Am An Avenger #1. She kicks butts and eats nuts! They get stuck in ruts and shoot themselves in the foot(s)! 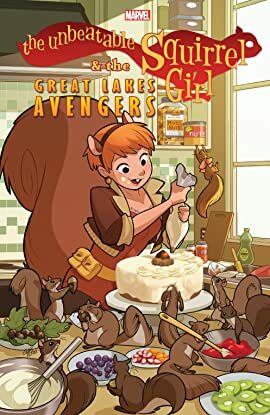 But could Squirrel Girl be what the Great Lakes Avengers need to propel them into the big leagues? Or will she be the death of them? The same questions apply to new foe/recruit Deadpool — who struts and spills guts — but he's just playing second fiddle to 'dorable Doreen. Follow Squirrel Girl's complete adventures with the GLA (or is that GLI? GLX? GLC? It changes a lot!) — including battling Maelstrom, playing poker with the Thing, joining the Initiative during Civil War...and saving the planet from inebriation!